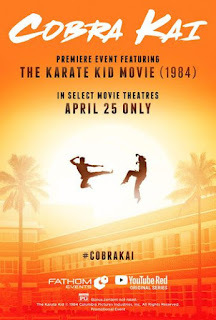 Home » Past Screenings » COBRA KAI Advance Screening Passes! COBRA KAI Advance Screening Passes! Do you want to see COBRA KAI before anyone else? Learn how you can see an Advance Screening to see it before anyone else. Fathom Events and YouTube Red are bringing the original 1984 classic The Karate Kid back to the big screen for a one-night event on April 25 only. The event includes the first two episodes of the new YouTube Red series, Cobra Kai. In The Karate Kid, Daniel (Ralph Macchio) moves to California with his mother but finds himself the target of a group of bullies who study karate at the Cobra Kai dojo. Daniel befriends Mr. Miyagi, an unassuming repairman who happens to be a martial arts master himself. Miyagi takes Daniel under his wing, training him to compete against the brutal Cobra Kai. Cobra Kai features the highly-anticipated return of two iconic characters. Now living in of Encino, Daniel leads an enviable life with his family. 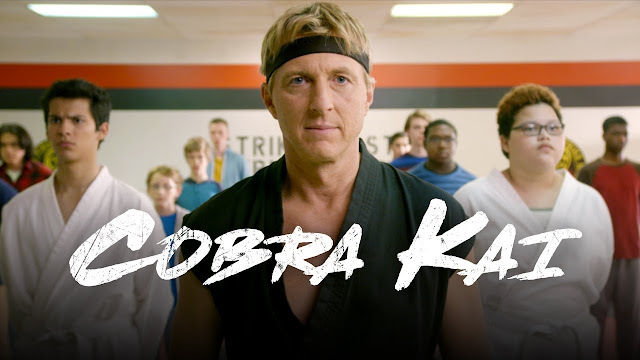 Meanwhile, his adversary, Johnny (William Zabka), whose life has taken a rocky turn, seeks redemption by reopening the infamous Cobra Kai karate dojo. Their lives become intertwined and the rivalry is reignited, setting forth the next generation of “karate kids”. You can watch COBRA KAI on YouTube starting May 2nd, 2018.